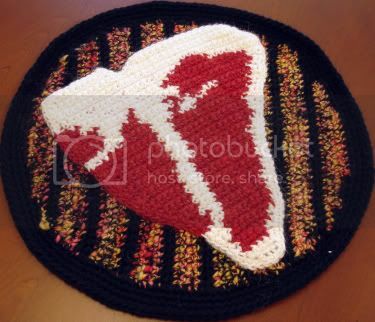 The good folks at Lark Books were interested in having a little crocheted meat in their next book. So, they inquired within as I am the self-avowed Queen of Crocheted Flesh. I don't know why, but that title makes me exceedingly happy. I know. Twisted. 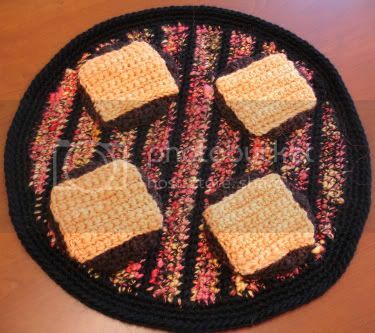 Anyhow, editors extraordinaires did favor a change of location for my examples of crocheted meaty fabulousness thinking grills might look better on the table than about the shoulders. I know. I can't believe it either! Mon Dieu! And assorted appliques for waiting for their close-up! 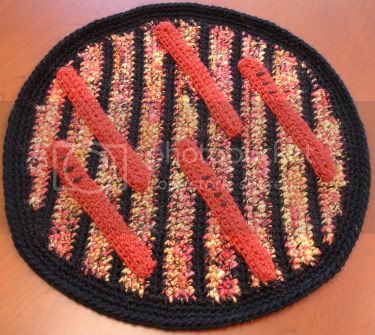 Get your hooks ready because this meaty pattern will soon be available in a bookstore near you! Oh, and knitters? Grilled meaty goodness coming your way soon! twisted or genius? we may never know but i sure do like them! lovely as always and scrumptious looking too! enjoy that title it's a good one! Yeah! Awesome as always! Mmmm.. soon there will be meaty goodness for me! I can't wait! those rock!!!! they would be perfect placements for picnic/barbeques! miss master crochet! congrats! you rule the meats!! Ahhhh. I love em--great job! Fabulous! I love it! Can't wait to see the book. 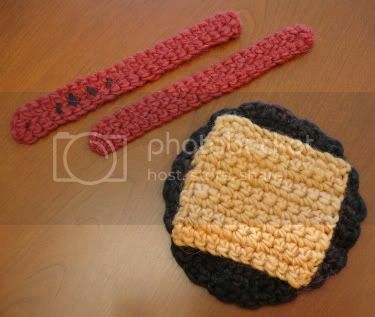 There has been a real lack of meat products available to the crocheting public... I am glad you are filling it! Ooh, I love em all, but adore the kabobs! Great colors, everything. Amazing once again. I think these will be the hottest barbecue and picnic accessory of all time! Oh, I can hardly wait to see you in print! Congratulations! May meat continue to bring you good fortune! Congratulations on the pattern placements. We've known of your genius for a while now; it's time to share it with the world! Like I said yesterday...the one word to describe YOU and your CREATIONS is F*A*B*O*O!!! Almost makes me wish I ate meat. They look great as mats! OMG - congrats on the book deal! How sweet, or should I say spicy? Depends how you grill it! Congrats! I'm not suprised that they approached you for a deal. You're a fabulous and original designer, O Mistress of Meats! Most excellent... *rubs hands together in an evil fashion* and now to take over the world. WOW! You are so good! How do you do it all? I can only get like one or two things done a week if I'm lucky! I would love to have some of these! A book, you say....happy dance! Congrats. And I have to say, I love the grill marks on the wieners....another perfect detail. I can now complain to the room mate that I need to go out and buy some meat coloured yarn. Good thing he knows I'm crazy. Fabulous, Regina! And a huge Congratulations to you! Yahoo! 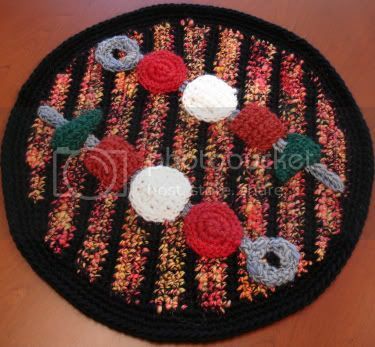 You are the food crocheter! wow! I've seen your work on the net. Love your work and your wonderfully unique ideas!! 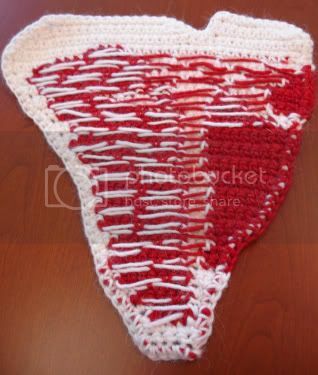 I bow to you, o, Queen of Crocheted Flesh! 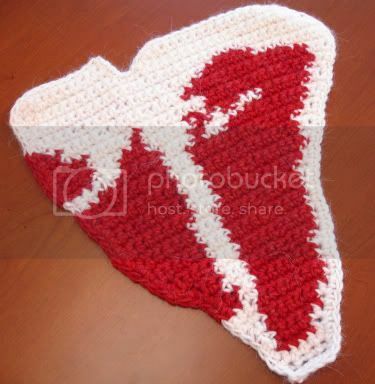 OMG This is the coolest crocheted thing I have ever seen. I absolutely love to grill. I've been known to grill anything not moving. Although my husband grills the steaks. You have inspired me to pcik up my needle and creat my own yummy creations. Bravo!!!! What a genious brain you have! Amazing!